This past weekend Izzy opened his mouth at mom and she saw something odd up in the roof of his mouth. Using a flashlight and a second pair of hands to hold him, she opened his mouth to find the cavities packed with food. Getting this food out proved harder than anticipated so Izzy took a trip to see Dr. Steve at Paws and Claws Animal Hospital today. Dr. Steve cleaned out Izzy’s mouth and saw that he has a deformity that is causing the problem. 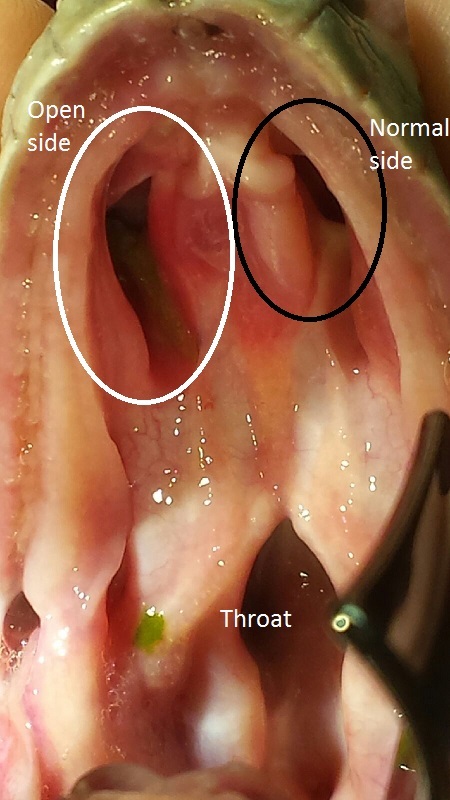 It seems that us iguanas have cavities in the roof of our mouths that lead to our nasal passages. We also have a flap over these cavities that closes when we eat. Izzy does not have a flap over one side so the food has been getting stuck in there. Dr. Steve checked him over real well and couldn’t find a reason for this soft tissue deformity, and it’s a bit odd that mom has never seen it happen before in the 2 years he has lived here. But as long as mom keeps an eye on it and cleans it out once in a while, it shouldn’t cause him any health problems.